All GSOFCT shops and service centers will be closing at 3 p.m. today. With the Girl Scouts, you'll make new friends and have a ton of new experiences that show how exciting the world is, and how awesome you are, over and over again. So, what are you waiting for? Start the fun today! Come join us at our Annual Meeting! This event is open to all members and is an ideal way to reflect on the achievements of our members as well as stay informed about the important issues facing the organization. Delegates will vote to approve the slate of the GSOFCT Board of Directors and the GSOFCT Board Development Committee. Register today and claim your spot! This Volunteer Appreciation Month, we are saying "Thank You" to our dedicated volunteers that have 10+ years of service with a special discount on a lifetime membership. Learn more about how to take advantage of this opportunity, available for a limited time only! Girl Scouts' new study “Decoding the Digital Girl” offers parents and teachers insight on how to help today’s girls become tomorrow’s tech leaders. Camp Life is the best life! 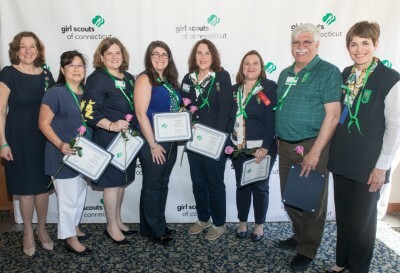 Watch her embark on a lifetime of leadership at Girl Scouts of Connecticut’s summer camps. Register today!